America’s cats are facing a healthcare crisis. The findings of a feline health study conducted by Bayer Health Care found that 52% of America’s 74 million cats are not receiving regular veterinary care. There are many reasons, first among them the perception that cats are self-sufficient. And while cats may be more independent than dogs, they’re also masters at hiding signs of illness, which is why regular veterinary exams are so important. The second problem is that taking a cat to the vet is stressful for most cats and their guardians. Education is key when it comes to getting cat guardians to understand the importance of regular veterinary care, which is why I was excited to hear that Discovery Channel’s Innovations, hosted by Ed Begley Jr. will explore feline behavior, the value of veterinary care and efforts made by veterinarians to improve the health and welfare of America’s more than 70 million pet cats. Innovations is an award-winning television series dedicated to bringing viewers the most up-to-date, cutting edge information across a vast array of industries. 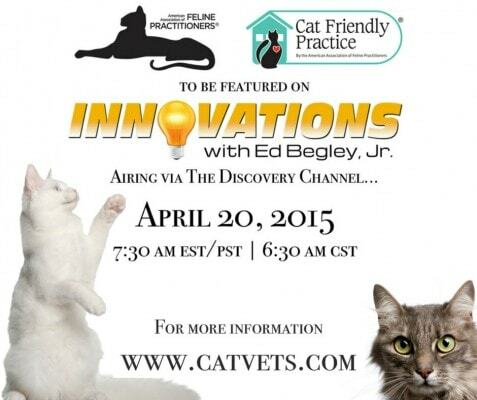 The April 20 episode will also feature the American Association of Feline Practitioners. The show will take a look at what the AAFP has done for cats by elevating the standard of care for them, and by educating cat guardians to increase their understanding of feline behavior, and the need to actively participate in their cats’ healthcare. The segment featuring the AAFP will air on Monday, April 20 at 7:30am EST/PST, 6:30am CST (check local listings). Not the greatest time slot for viewing for most people, so be sure to set your DVR! For more information about the AAFP, visit catvets.com. Thanks for a great post. Definitely going to keep my eyes open for this. The best thing I did for my new kitten’s health was to buy an automatic self cleaning litter box. After a lot of research, I found that having a perfectly clean litter box at all times can make a huge difference in the health of your pet. Even though I’m not a fan of automatic litter boxes, you are absolutely right that a clean litter box is extremely important, Amy. Thanks for the post. Will be watching this one.